Shrimp Fried Rice Recipe in English is an easy and traditional cooking recipe to prepare at home. It provides you an awesome taste of Chinese Recipes. A delicious and very simple Chinese fried rIce dish with fresh Shrimp, red pepper, Zucchini and green peas. MIX the soy sauce, oyster sauce and sesame oil in a small bowl. HEAT a wok or large frying pan over a high temperature then add 1 tablespoon of the oil. ADD the shrimp and stir-fry for 2 minutes. REMOVE the shrimp from the wok and set aside on a plate. HEAT the remaining 2 tablespoons of oil, add the red pepper and stir-fry for 1 minute. ADD the zucchini and stir-fry for 2 minutes. ADD the peas and garlic and stir-fry for 30 seconds. ADD the rice and stir-fry for another minute, tossing to separate the grains and combine well. ADD the sauce mixture and stir-fry for 2 minutes. ADD the cooked shrimp and toss to mix and heat through. 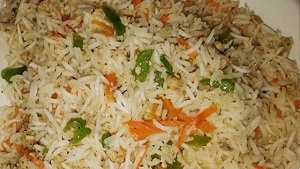 I have always followed shrimp fried rice recipe by chef Tahira Mateen. She has great collection of cooking foods and recipes. But now I want more chinese recipes but all these are not provided by Tahira so which chef has all these recipes?